It’s that time of year again. Hunting season is right around the corner. That means it’s time to empty the freezer of what’s left from last season. Right now my inventory includes a few pounds of ground venison, a pound of venison sausage, some hind steaks and half a venison backstrap. Scratch that. We just ate the backstrap for dinner and it was delicious. The backstrap, which often gets confused for the tenderloin, runs outside and parallel to the spine. The tenderloin is on the inside. There are two backstraps and most of the time they’re about 2′ to 3′ long. 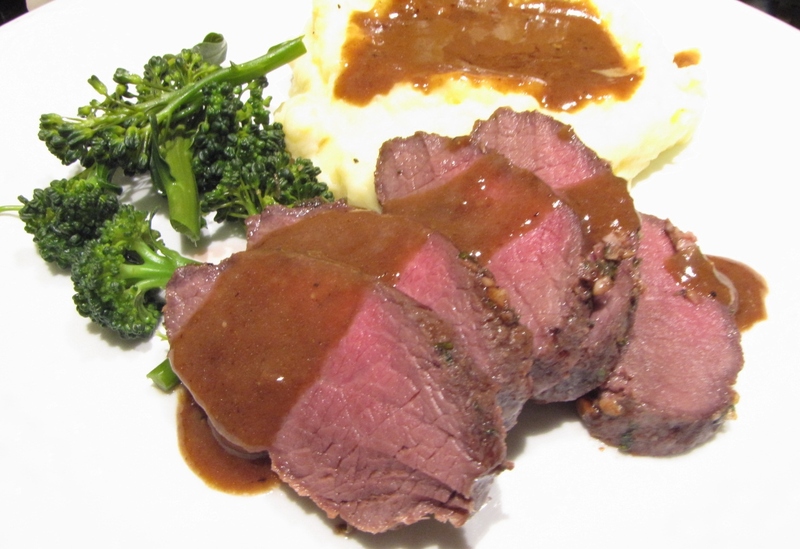 Since venison is so lean it can be a bit tricky to cook. 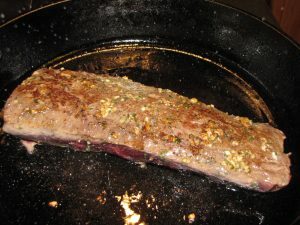 For this recipe I rubbed the backstrap with an herb mixture, browned both sides over medium heat and finished in the oven. Be sure to trim the backstrap of any silverskin. Silverskin is that whitish, tough layer of connective tissue that, if cooked, is completely and totally unchewable. So get rid of it. Next take two fresh sage leaves, about a 2″ length of rosemary (with leaves stripped off the stalk), two cloves of garlic, a teaspoon of salt, pepper and olive oil. 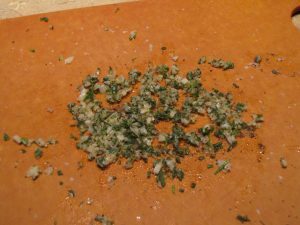 Finely chop the herbs and garlic. 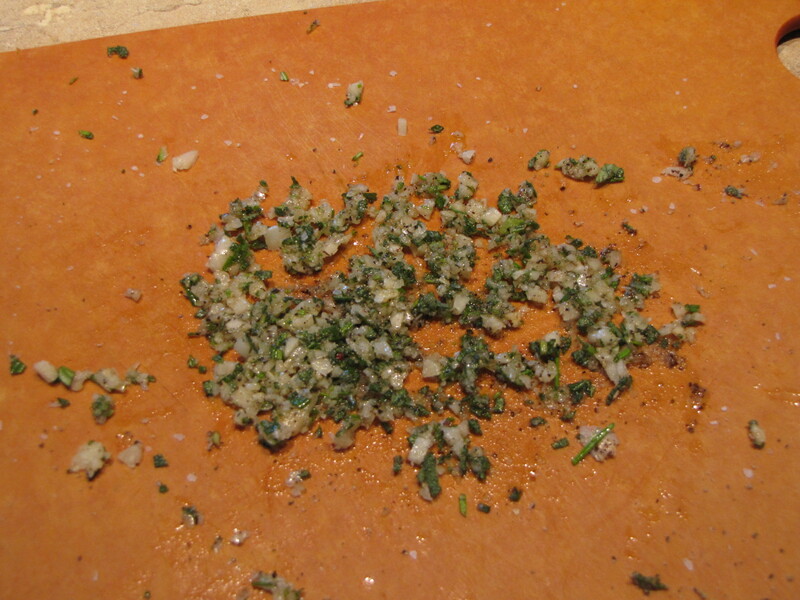 Add the salt and enough olive oil to make a paste. Add 1/2 teaspoon of black pepper. Rub both sides of the backstrap. Place in a casserole. Drizzle wth a little balsamic vinegar. Cover with plastic and let sit for at least an hour before cooking. Venison is super lean. After experimenting with this recipe a few times I found that it’s more flavorful if you let it marinate for at least an hour. We like a little balsamic vinegar drizzled over the meat. It adds that little special something to the pan juices – which is important when you make your gravy. When it’s time to cook, preheat oven to 400F. In a large, heavy skillet (I use cast iron) add just enough canola oil to coat the bottom. 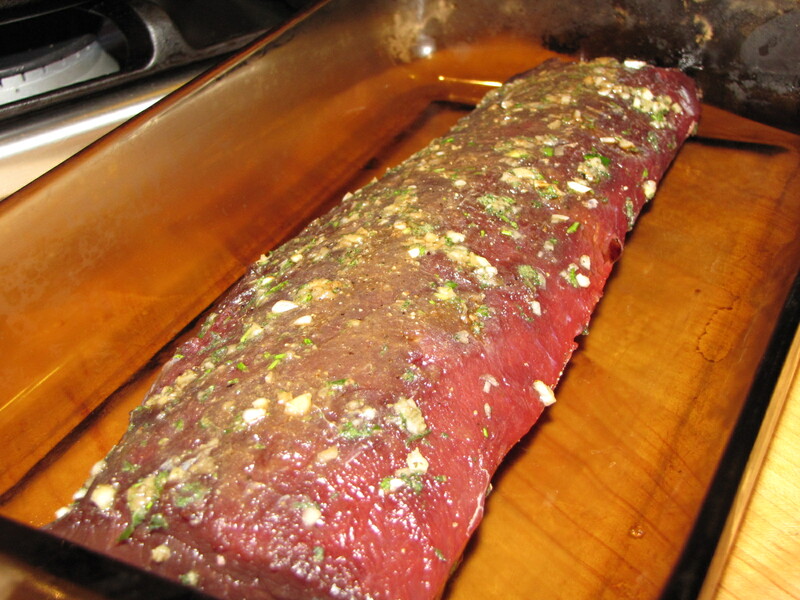 Brown each side of the backstrap for two minutes and then place in the oven for 15 minutes. One side browned. The other side is browning and then I’ll pop it into the oven. You’re going for medium rare. Don’t overcook otherwise the meat will be tough and you don’t want that to happen. Be sure to let the meat rest. While it’s resting, you can make a pan sauce to go with it. 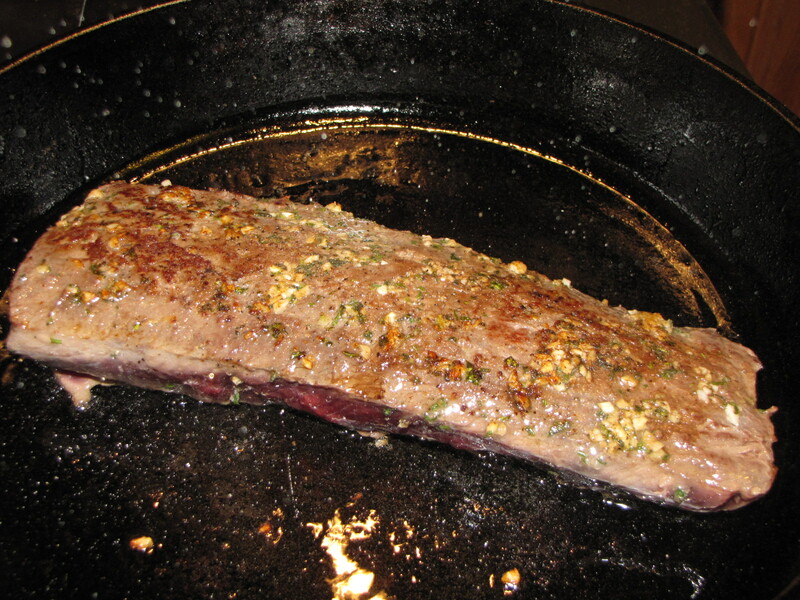 Just take the meat out of the skillet and let it rest on a plate. Over medium heat add a half tablespoon butter to the skillet. Whisk in a heaping tablespoon of flour. Keep whisking and add a half cup water, a half cup of red wine (I used some pinot noir) and any juices that have come out of the meat while it’s resting. Salt and pepper to taste and add a little more butter just to finish off the sauce. We like it with mashed potatoes and broccoli. After you season it, do you leave it out for an hour, or put it in the fridge? You can put it back in the fridge. Love to hear how yours turned out.